This story was updated at 3:10 p.m. EDT to reflect researchers' revised forecasts of the reach of this weekend's northern lights shows. A massive solar eruption may trigger an exceptional weekend northern lights display, giving skywatchers around the world a treat, a NASA scientist says. 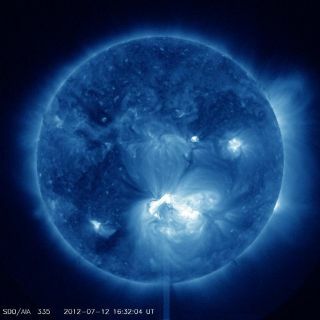 The sun unleashed an X-class solar flare — the most powerful type — at 12:52 p.m. EDT (1652 GMT) on Thursday (July 12). The storm also triggered a huge eruption of solar plasma known as a coronal mass ejection, or CME, which is now streaking directly toward Earth at roughly 3 million mph (5 million kph). The CME is expected to hit our planet between 5:00 a.m. and 9:00 a.m. EDT (0900 to 1300 GMT) Saturday (July 14), according to forecasts by researchers at NASA and the National Oceanic and Atmospheric Administration's Space Weather Prediction Center (SWPC). The CME's arrival at Earth will likely spawn moderate geomagnetic storms lasting through Sunday, which may cause temporary disruptions to GPS signals, radio communications and power grids, scientists said. Geomagnetic storms often generate dramatic aurora displays, which are also known as the northern and southern lights. So aurora fans should definitely crane their necks skyward this weekend. The latest geomagnetic storm predictions "would indicate aurora down to the northern US," C. Alex Young, a solar astrophysicist at NASA's Goddard Space Flight Center in Greenbelt, Md., told SPACE.com in an email update. Earlier forecasts had hinted that this weekend's light shows could reach as far south as Alabama. But further number-crunching today scaled back estimates of the coming geomagnetic storm's severity, Young said, suggesting a more limited auroral reach. "I am disappointed that I probably won't see any in Maryland," Young said. Auroras result when charged particles from the sun collide with molecules high up in Earth's atmosphere, generating a glow. The northern and southern lights are usually restricted to high latitutes because Earth's magnetic field lines tend to funnel these particles over the planet's poles. After remaining surprisingly quiet from 2005 through 2010, our star woke up last year. It has remained active in 2012, spouting off numerous CMEs and powerful solar flares, including an X5.4-class eruption in March. Such outbursts are likely to continue over the next year or so. Solar activity waxes and wanes on an 11-year cycle, and scientists think the current one — known as Solar Cycle 24 — will peak in 2013. We should expect more action from sunspot AR1520 over the next week, said Joe Kunches of the SWPC. The sunspot region is currently facing Earth, sitting near the center of the sun's southern hemisphere. "It's still big. It's right down Main Street," Kunches told SPACE.com. "It's in an absolutely prime spot." Editor's note: If you snap a photo of sunspot AR1520 or any amazing northern lights photos and you'd like to share them for a possible story or image gallery, please send images and comments to managing editor Tariq Malik at tmalik@space.com. SPACE.com Managing Editor Tariq Malik (@tariqjmalik) contributed to this story. Follow SPACE.com senior writer Mike Wall on Twitter@michaeldwall or SPACE.com @Spacedotcom. We're also on Facebook and Google+.